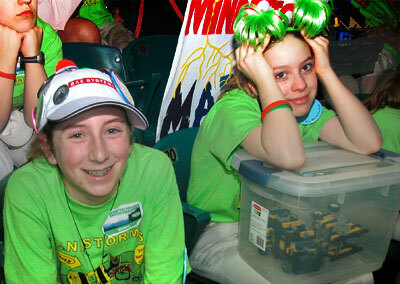 Rookie team members Katie Hammes, left, and Amelia Jennings enjoy the FIRST LEGO closing ceremonies. 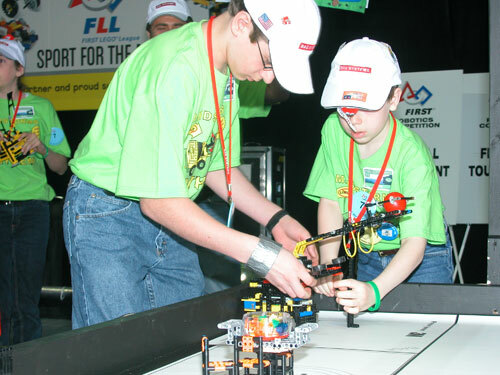 MILFORD - When it came to the performance of their robot, New Hampshire's Mindstorms Mayhem FIRST LEGO team was even more than perfect. Mindstorms Mayhem is a team of home-schooled students who represented New Hampshire. They were among 75 regional winners from 20 countries, including 47 U.S. teams, to compete in the international competition in Atlanta, Ga. last weekend. Nathan Streeter, left, and Ryan Simard prepare the team's robot for the center ball mission. Mindstorms kids are from several southern New Hampshire towns and they not only got the most points possible - 400 - they picked up an extra five points by moving their opponent's ball out of the center of the competition circle and putting it into the Mayhem basket. But when the final tallies were complete, the Mayhem kids weren't able to match last year's over-all performance when they won the Director's Award, the symbol of the LEGO world championship. This year; they came in second. "Our robot performed the best in the world festival," said Charlotte Gray of Milford, who handles publicity for the team, "and the team continues to perform well in all categories." Team members are Katie and Nicholas Hammes of Milford, Melissa and David Gray of Milford, Daniel and Victoria Umenhofer of Wilton, Jean-Marc Le Doux and David Schunemann of Hollis, Ryan Simard of Lyndeborough, Amelia Jennings of Merrimack, and Nathan Streeter of Bedford. That team includes coaches Ken Streeter of Bedford and Bill Gray of Milford, mentors Christopher Jennings of Merrimack, Ben Streeter of Bedford, and Nathan Gray of Milford. Being second in the race for the Director's Award isn't shabby. The award, according to Gray, "measures how the children inspire and motivate others about the excitement and wonders of science and technology while demonstrating gracious professionalism."